Like most land mammals, humans are naturally able to float and swim. While we are not able to approach our maximum land speeds, humans can achieve considerably high speeds in the water. With the help of training and equipment such as fins and bodysuits, we are now able to achieve higher speeds than ever before. 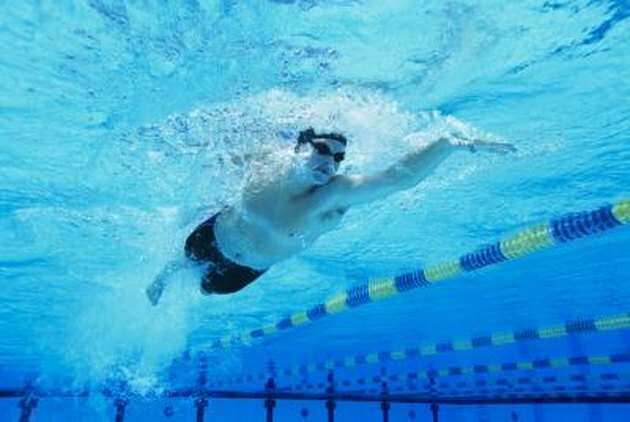 Despite such improvements in swimming ability and technology, however, humans are ultimately limited in their quest for ever-faster swimming speeds. The maximum swimming speed for humans is approximately 2 meters per second, or approximately 4.5 miles per hour, Dutch researchers Huub Toussaint and Martin Truijens reported in the journal "Animal Biology" in 2005 — only 16 percent of the maximum land speeds of elite human sprinters. This speed reflects the maximum water sprinting speeds of elite human swimmers, meaning that the speed of the average human swimmer over long distances is much lower. Although the researchers noted that the average sprinting speeds among swimmers is 1.64 meters per second, or approximately 3.7 mph, humans' ability to sustain such speeds over long distances is limited. Toussaint and Truijens noted two main factors limiting the speed of human swimming: Our ability to propel ourselves in the water is limited by physical power, while any improvements in propulsion related to our body composition or techniques may increase the amount of drag that we experience as the water resists our movement. Despite the contrasting forces of drag and propulsion, they suggest that you may be able to improve your speed by holding your hand stiff, angling it properly and minimizing the amount of time spent pulling your arms through a stroke. In addition, Italian researcher Alberto Minetti and colleagues noted in a study published in the "Journal of Biomechanics" in 2009 that spacing your fingers slightly while following the above recommendations may lead to greater speeds. While the use of fins and flippers can help humans to achieve speeds greater than those of world record-holders, such equipment is not allowed for use in competitions. The bodysuit, introduced in 1999 and banned from competition in 2010, is a polyurethane wetsuit that covers nearly all of your body. Improving your ability to float and reducing the effect of drag on your body, the use of the bodysuit was associated with the majority of world records broken during this period, Australian researcher Jennifer Craik observes. In a 2011 paper on the bodysuit published in "Culture Unbound: Journal of Current Cultural Research," she notes that efforts to increase the speed of human swimming have now extended to the digital world, with computer simulations and full-body scans while swimming now used to dictate optimal form and technique. Looking at the history of swimming world records, it appears as though the speed of human swimming is constantly on the rise. However, according to a team headed by Alan Nevill of the University of Wolverhampton, United Kingdom, there appears to be a limit to our swimming abilities. In study results published in the "International Journal of Sports Medicine" in 2007, these authors explored the fastest known male and female swimmers of the previous 50 years. Using front crawl world records as their guide, they found that the biggest gains in world-record speeds occurred from the 1960s to 1970s. After that, however, only minimal gains in speed were made, leading the authors to conclude that we are beginning to approach the highest swimming speeds possible for humans. Which Is a Better Swimming Workout: With Fins or Without?